As a brand new Etsy shop owner I am sure you read all kinds of info from “old” sellers that doesn’t seem like it applies to you as a newbie seller! I wrote this post about Etsy shop ideas and tips for both handmade products and digital printables right when I opened my Etsy store and was just starting to make money! Okay, let’s just get this out there on the table right now! 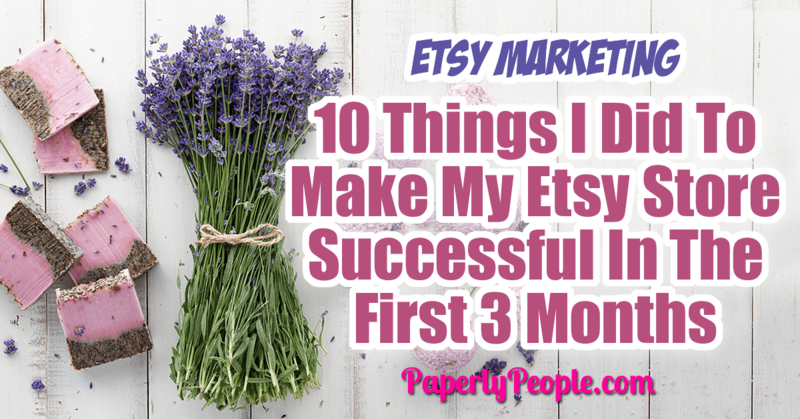 I started my Etsy store exactly three months ago today and I immediately started consuming how to videos, podcasts and information about how to launch an Etsy store and what I could expect. While there were tons of great ideas (some of which might or might not work now), the one thing I kept hearing over and over again was, don’t expect to sell anything for three months at least… wait… what? I should just get my Etsy shop set up and then twiddle my thumbs waiting for a sale or two to trickle in the door, heck-to-the-no on that for me! So I decided that I was going to do everything in my power to sell the crap out of my items, whatever it takes baby, whatever it takes. When I started the Paperly People Etsy store I knew my forms were great, but no one else on Etsy knew how cool I was. Luckily I have amazing friends and one of my besties bought one of my forms on the VERY FIRST DAY. That did two things for me, first it gave me confidence. My brain didn’t really think about the fact that it was a pity buy, it just was excited that I got a sale! Second it showed people coming to my store that I had made a sale. When you go to a store and it has NO sales at all, you wonder what is wrong with it! This is about another store I don’t have anymore, Work Necklaces, but the principle holds true. I went to an in person event and gave away a free necklace if they would buy one on Etsy. I had one taker and now have more sales showing up on my store. I also had another bestie who wanted a bunch of them, I “sold” her 3 on Etsy and gave her 5 in real life. Again, just to build up the sales on my Etsy store. The nice thing is that I have enough profit margins in my products to be able to discount to friends and still make some money! This one is a no-brainer for me. 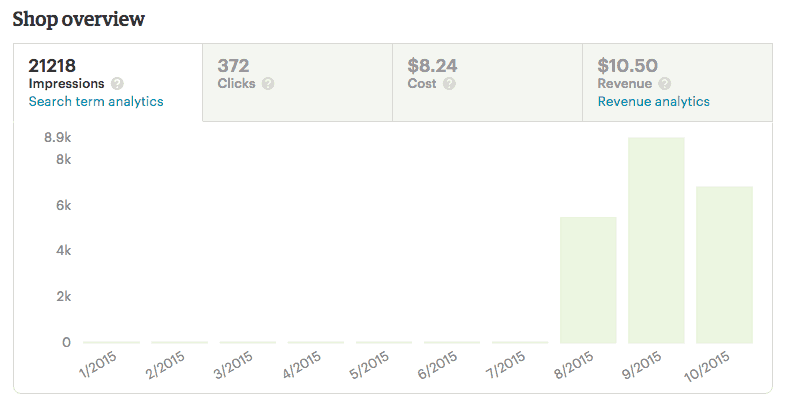 Etsy has the ability to use promoted listings built right into the system. It will give you a really high sounding number to start per click. I think mine was in the $.41 cent range, but now-a-days I am paying between 5-7 cents a click. They will track how much you have spent and how much you have made in revenue. So far I have spent $8.24 and made $10.50, a net gain of $2.26. Now if you looked at this at the start, it looked like I was just spending to get no sales and that made me sad. But I kept up, for heaven’s sake, the max it can be is $1.00 a day spend to start so it was worth testing. There is some awesome data in there about which keywords are working that makes doing promoted listings worth it even if you don’t make any sales, but they don’t track favorites. I would REALLY like to know how many people are favoriting items that they have seen as a result of the promoted listings. As long as they buy the item in the ad within 30 days or they buy any item within 24 hours of clicking on the ad, it counts toward your Promoted Listing revenue. While it great that they tracks sales for that exact item, I REALLY don’t care what they buy, I would just like to know that my marketing dollars are being spent wisely! I have heard a bunch of lamenting that Etsy Sellers are getting Favorites and no sales. let’s just get this out there now, FAVORITES ROCK. Favorites mean that someone likes something you made enough to want to keep track of either that item or your shop in general. Additionally, they will get notifications on their “home page” when you list a new item. 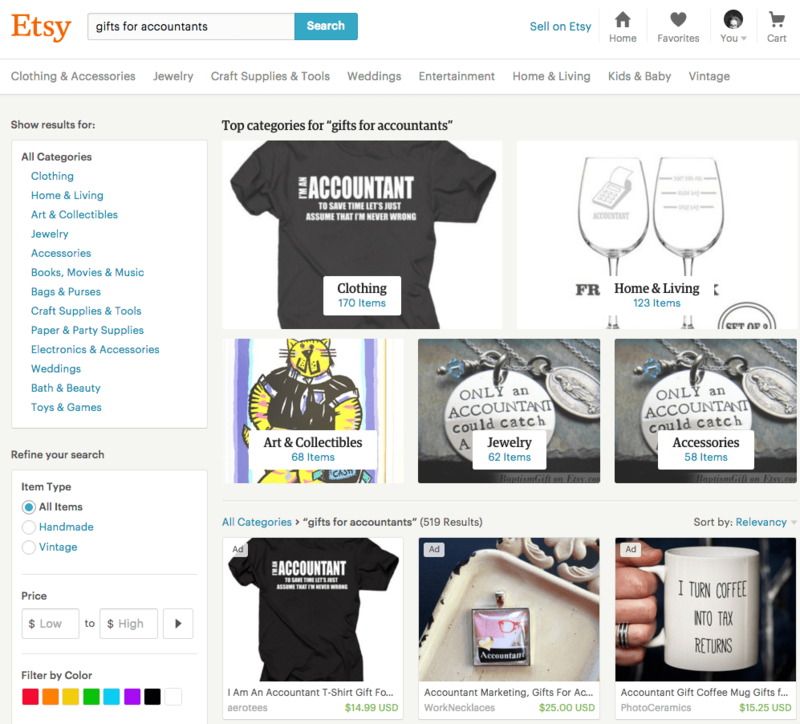 List more items – as you can see, Etsy shows your new products to people who have favorited your store. Have great products – you need to make sure to have great pictures and a big description that will people enough information to buy. I have LOTS of great information about how to do Etsy SEO including, SEO For Etsy Sellers | Ultimate Etsy SEO Guide. Etsy SEO is a really specific way of writing your listing titles and tags. I have done Google SEO for years and I am here to tell you, it is about a MILLION times easier to do Etsy SEO than it is to do Google SEO. For one, the numbers are just infinitesimally smaller. Doing a search for “gifts for accountants” on Google, there are 6 MILLION plus competing results. And on Etsy there are 519, with my little necklace front and center, item #2. Most Etsy sellers are not motivated or educated enough to do hard-core SEO for their items. It is SO worth your time to learn this skill and apply it to all of your listings. Because I am new, I don’t have baggage about how Etsy used to work for sellers. I don’t care that it used to be enough to just keep re-listing your products or that there are more people competing now. The one thing that I have heard time and time again from “old” Etsy sellers is that they are bitter that they have to learn something new just when they got everything figured out. Stop that! It doesn’t help and just makes you grumpy. Find out what is working now and start implementing that! I KNOW, it is hard enough to do Etsy marketing, now I want you to do more work with a site of your own? Yes! Having your own website that can feed into your store is a BRILLIANT idea. 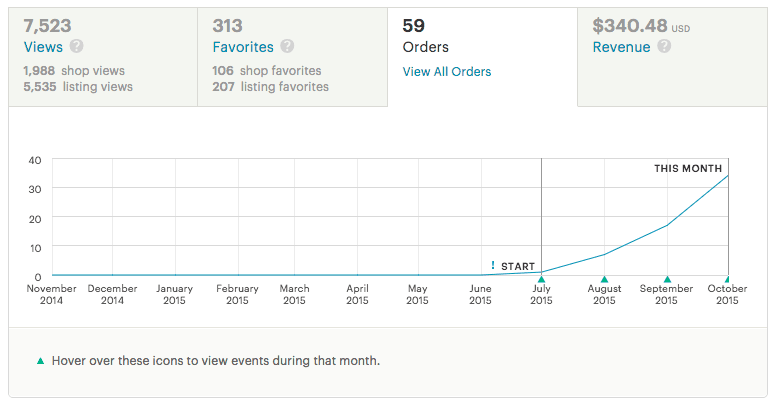 As you can see here, I have had over 600 hits to my Etsy store and products from my websites and my email list. This is because the content on my websites are FEEDING into the forms. If I do a form about Direct Sales Marketing, I write a post or have a guest poster that talks about that EXACT topic. This makes a seamless transition from my site to the shop. What I find SUPER interesting though is the numbers. I have over 20,000 views per month on Marketing Artfully and just 237 hits while my much smaller site (this one) which only has about 1,000 views sent more traffic at 251 hits. This is AWESOME for you! 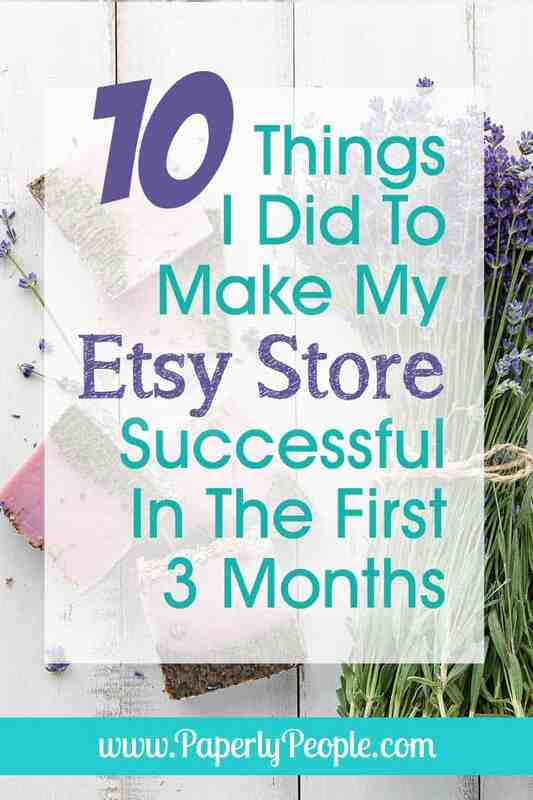 You don’t have to have a big, old site to have success with starting your website, instead you should have a good, solid site that will feed into your Etsy store. I have big social media accounts (30K+ on my Twitters alone) but that doesn’t necessarily translate into big numbers of views on Etsy. I have had only 176 views in three months from Facebook and 71 views from Twitter. Now, that could be because my forms are not a great visual product, but it is also because doing free social media marketing IS harder than it used to be. If you are going to do social media for your shop, concentrate on Facebook, Pinterest and Instagram first and go with LinkedIn and Twitter after you have the others set up! Back in the day it was popular for Google SEO’s to try and cheat their way to results. They would hire people to make comments or do links or any other number of things to try and “game” the system (fool Google into thinking they were more popular than they were). Some of the tricks that people are using on Etsy seem a lot like that. I have read that you should join teams that go around randomly liking pages for each other (sounds a lot like the reciprocal link trick). They also share out their buddies links or have specials where they almost give away their products just to get sales. This all sounds a little bad to do. Etsy is a huge software company and I am sure that they can track accounts that are doing those things. Additionally, they surely have algorithms that judge how many favorites there are to sales made and if you are fraudulently inflating your favorites without increasing your sales, that is going to set off a red flag too! Take that effort and put it into your own shop or website. Use the time you will save “cheating” and do something productive and marketing-y with it! One last thing I do is make products that people want. I ask everyone I meet what kind of forms they would like to have and make those for my shop. I check my Top Keywords in Etsy and see what people were searching for when they found my item and if it wasn’t an exact match I see if I would like to add that form to my products. It is great to be an artist, but better to be a wealthy artist! All things being equal I would rather make things that I know will help people and sell than to spend time making things that I think they will like, only to find out that they are duds. Okay, that is a wrap! Those are a few of things that I did to get traction for my store. YES there was more that I could have done, but I am super pleased with how far I have come in such a short time. Just so you know, my sales numbers for the first three months are 93 sales, 106 admirers and 19 5-Star reviews. I wish I could have gotten over 100, but based on the time of year that I launched my shop, I am pretty darn pleased.